Authorities suspect Angela Sanclemente of running an organization that uses models as drug mules. Model's mother arrives at hostel, tells media "My daughter is innocent"
(CNN) -- A former Colombian model wanted on drug trafficking charges was captured Wednesday in Argentina, a spokesman for the Argentina Airport Security Police said. Angela Sanclemente, 30, was picked up the K-Lodges Hostel in Buenos Aires' Palermo neighborhood, police spokesman Maximiliano Lencina told reporters Wednesday afternoon. Lencina said Sanclemente was registered at the hostel -- popular with foreign university students -- under the name "Annie" and had told people at the hostel she was from Mexico. She had dyed her brown hair to blonde and was alone in the hostel when detained. Lencina said Sanclemente has been in touch with her lawyer and will be questioned on Thursday by an Argentine federal judge. She will be transported Wednesday afternoon from the hostel to Airport Security Police offices at the Ezeiza International Airport, he said. Interpol issued an international arrest warrant for Sanclemente in March. Investigators at the time said they believed she might be in Argentina, where authorities suspected she may be the "queen-pin" of an international operation that uses models as drug mules to move suitcases loaded with cocaine out of the Buenos Aires airport. "We believe she played an important role in the drug trafficking organization," said Lencina. Argentine authorities had already detained several alleged members of the trafficking gang, and sources told CNN that some of those arrested named Sanclemente and her Argentine male model boyfriend -- now in custody -- as ringleaders. In Facebook messages posted earlier this year, Sanclemente maintained her innocence. "I'm very sad and hurt by the bad information. I don't know how the press can destroy an innocent person," she wrote. "I don't want to go to jail. I don't deserve it. I am innocent." Sanclemente's mother, Yaneth Valencia, arrived at the hostel, where she was denied permisssion to see her daughter. She told reporters outside the hostel that "there is a plot against her." "They are using my daughter," she said, without specifiying who she meant. "My daughter is innocent." She told the reporters that she would be "happy to give you an interview in a studio," but would charge them, "because I need the money to help my daughter." Sanclemente first hit the headlines in 2000 when she was 20. She won Colombia's prestigious Queen of Coffee beauty pageant. Victory was short-lived. Judges dethroned her after two days when they found she had been married, contrary to competition rules. That marriage -- to a Barranquilla, Colombia, businessman -- lasted three months in 1998. He paid for her to study journalism at Barranquilla's university. A university friend, who did not want to be named for fear of reprisals, said Sanclemente dropped out of college after three semesters and spent tuition fees on silicone breast implants instead. That friend said Sanclemente idolized Colombia's then-top model Natalia Paris. She dyed her hair blond and imitated Paris' distinctive accent to appear more like her. 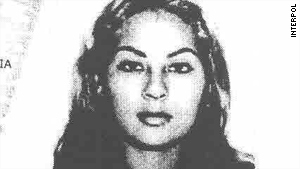 Paris married a drug trafficker turned DEA informant, known as Julio Correa. He was killed in 2001 by his former associates when he returned to Colombia from Miami, Florida. Drug underworld sources said he was cut up in a meat grinder. Sanclemente left Colombia around 2005 and headed to Mexico, where she continued to pick up modeling assignments and bit-part roles as a TV actress, according to friends. CNN's Brian Byrnes and Karl Penhaul contributed to this story.